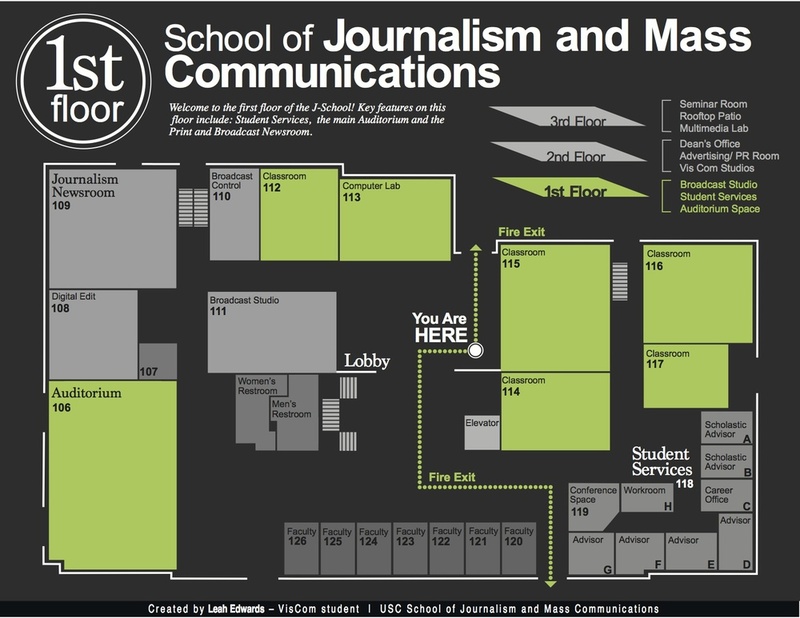 This map of the School of Journalism and Mass Communications was created to showcase features of the first floor with a simple inset map to list key features of each floor. It was designed with the intent of being a print piece which would be posted inside of the new building. This typeface is based on the psychology concept of the Rorschach test, a series of inkblots through which a viewer deciphers hidden images. The letters were created by hand, using India ink and watercolor paper, by applying the ink to half of the page and folding it to create a symmetric pattern. This is a flatpack concept for Carolina Wildlife Care, an organization working for the preservation and protection of native South Carolina animals. This flatpack features a white-tailed deer and the Southern fox squirrel, two common animals in the state. The Fuji Film logo was re-created as a letter mark, using the company’s initials to imply the shape of a Polaroid camera. The typeface was created specifically for this logo and modified with color and transparency to represent filmstrip overlays. 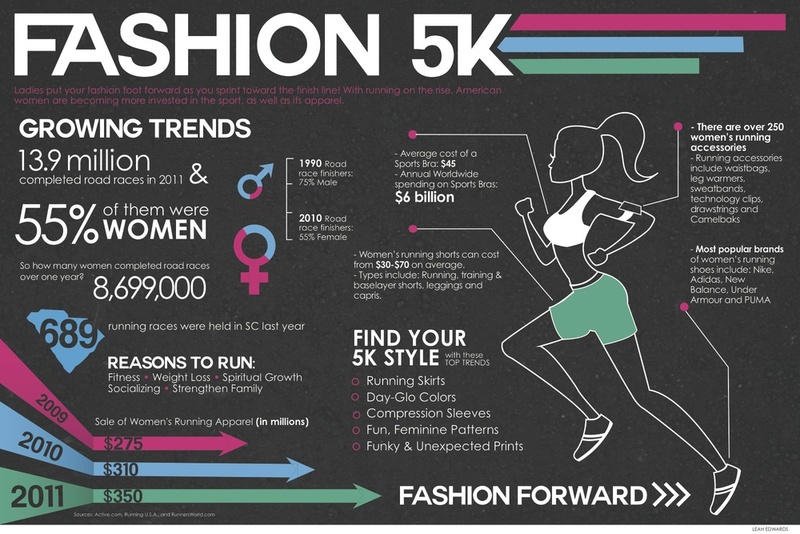 The Fashion 5K infographic focuses on showcasing the increased popularity of women running and analyzes statistics on women’s sportswear as supporting evidence. The significant increase in the sale of women’s running apparel has led to nearly a $100 million growth in the industry in just two years. Sharky’s is a local bar in Five Points, Columbia whose clientele are young, college students. This new logo utilizes the shape of a beer bottle to reference the business while the wave and in illustrations stay true to the name of the establishment. To the right is a branding and packaging concept for Ministry of Hope non-profit organization. The flatpack design can be assembled with only scissors and folding; no adhesives are necessary. Additionally, the design can be printed from a single sheet of letter-sized paper. After completing a historical documentation of the State Hospital for the South Carolina Department of Mental Health, I created a magazine mockup; the list identifiers disclose the specifics of each photograph featured. The Office of Student Engagement’s annual event series, Sophomore September, celebrates the second collegiate year experience. A full sized advertisement listing all of the month’s events is shown, sized for a digital display board. 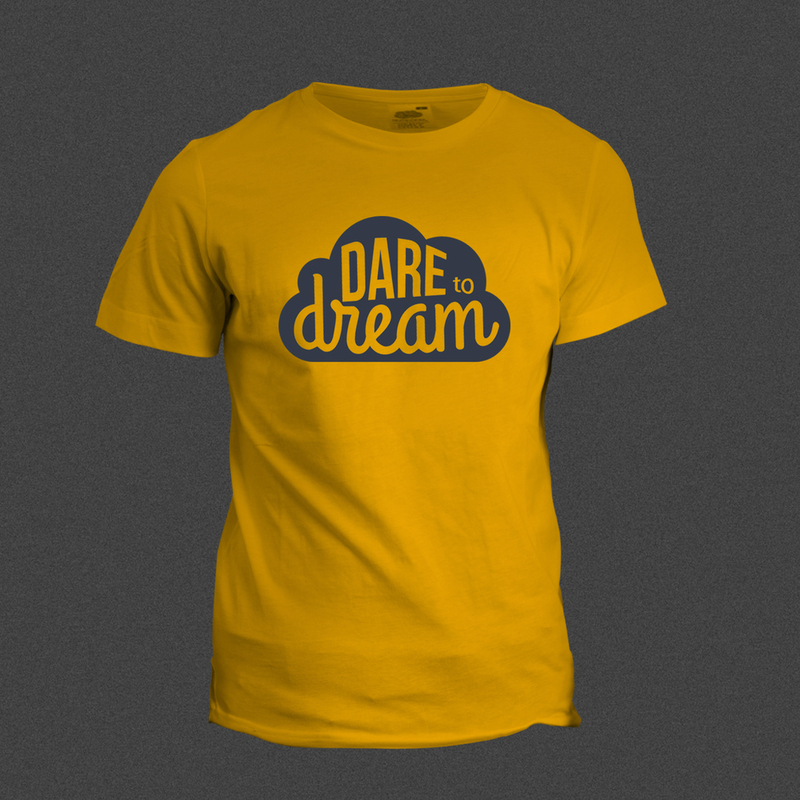 The T-shirt pictured features a logo for the Dare to Dream Conference at Redemption. The typefaces utilized within the shape are all custom, hand-drawn fonts, tightly arranged to fill the space. The concept I was attempting to illustrate was, "Dream Big." For this Lifegroups advertisement I utilized an autumn color scheme and a background image I had taken of the fallen leaves last year. The typeface used for "Together" is hand-drawn and gives the piece contrast against the more rigid elements of the design, like the subtext and the logo. For each installment of Redemption's "The One" series, there is a challenge or question which is addressed. 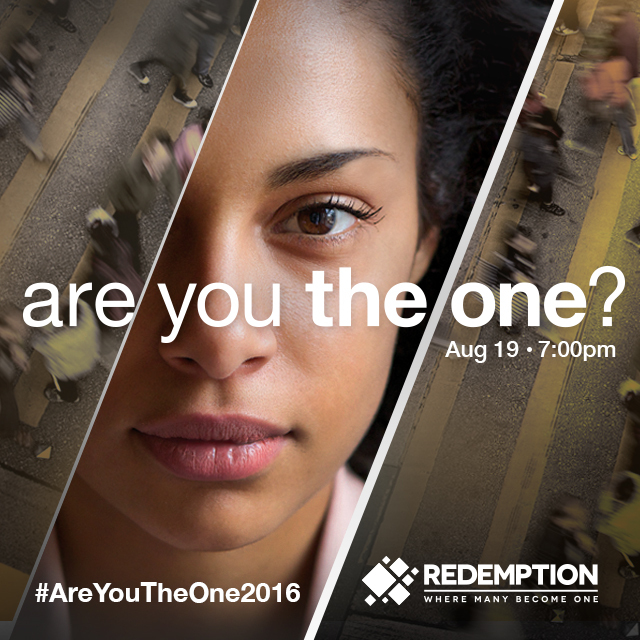 The August service asked young adults in the audience, "Are You The One?" and the graphics were design to reflect the intensity and weight of that question. Imagine Sports and Fitness is a project I was able to lead during my time at Redemption. This rebrand included a new logo, complete with associated marketing materials (posters, mail pieces, brochure, website, etc.) and a floor-to-ceiling redesign of the fitness facility. For this logo, I wanted to focus on the duality of the gym's new name, capturing both the sports programs offered and the mission of personal fitness. The Draft is a volunteer rally held every year at Redemption, in which volunteers are recruited to a football-themed kick off in the fall. For this LED wall graphic, I utilized an image of a real volunteer and superimposed football face paint onto her, giving the promo a personal aspect with an edge. The interior mock-up pictured is from a rebranding project I did for Imagine Sports and Fitness. As a part of this extensive rebrand, I designed a new interior for the facility. This image depicts vinyl wall decals for the outer track, new paint on the walls, and a new gymnasium floor. The graphics feature inspirational quotes and arrows which not only are aesthetic, but serve to illustrate the flow of the track. I created this logo for Ron Carpenter Ministries' Marriage Rendezvous event. The design is based off of the the definition of the word "rendezvous;" a French term meaning, " a location where two meet." Being a marriage conference, I wanted to include a romantic aspect in the logo, hence the heart- which is comprised of two location drop pins. So the icon literally illustrates a point where two meet.